Gold can be found almost anywhere on the planet, and the key to recovering it is knowing what type of gold it is. Gold deposits can be grouped into two primary classes: placer deposits, where the gold is exposed from weathering and erosion, and hard rock, where the gold is still trapped within the host rock. Gold recovery methods for these two types of deposits vary greatly from simple panning to a complex network of grinding, chemical leaching, gravity concentration and more. With so many different ways to recover gold, how do you choose the optimal process for recovery? Placer deposits contain gold that has already been concentrated and freed by natural weathering. They can be mined easily without the need for blasting, crushing, or grinding. Gold panning can recover placer gold and is popular amongst geology enthusiasts because of its relative simplicity. Panning is a form of gravity concentration as materials with a low specific gravity spill out of the pan while materials with a higher specific gravity sink to the bottom of the pan where they can be examined. Panning for gold can be great fun but is not very practical for gold recovery on a large scale. 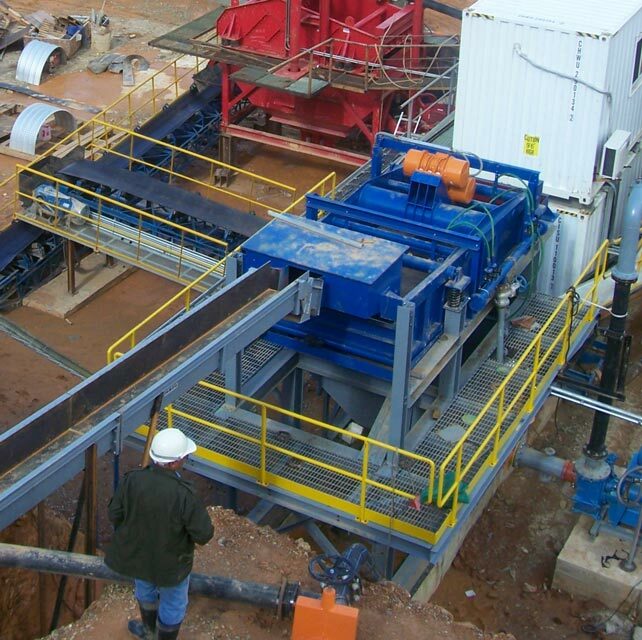 The most cost-effective gold recovery solution for placer deposits is using a gravity concentration circuit. First, the material is screened to remove large rocks and boulders. Then a sluice or jig is used to recover the gold. For deposits with high clay content, the rocks are cleaned with a trommel or rotary scrubber to remove contaminants, and then gold recovery can take place. If a significant portion of the gold is fine (<300μm), a high G-force gravity concentrator like the Falcon SB Concentrator can be used to improve recovery. Hard rock deposits, otherwise known as lode deposits, have gold trapped inside the surrounding rock. Blasting, crushing, and grinding are necessary to liberate the gold for recovery. Hard rock gold deposits have three sub-classes: free-milling, sulfide-associated and refractory. Gold ore is considered free-milling when it is easily liberated by grinding and separated from the other minerals. A more technical definition is that you are able to recover over 90% of the gold by a conventional gravity-cyanidation process with low reagent consumption. Free-milling gold can be further classified into low grade and high grade which helps determine the most economical and optimal gold recovery method. Low grade free-milling gold deposits contain less than 1 g/t of gold. This low grade ore is crushed and heap leached to recover the gold. While heap leach recoveries are lower than in conventional gravity-cyanidation, the savings in capital expenditure may justify this route. Blasted rocks are crushed and ground to a size less than one inch. They are then sent to a hydrocyclone, which sorts the particles based on their size and density. The fine, light particles are sent to the cyclone overflow, and the coarse or dense particles are directed to the cyclone underflow. The fine and light particles are now ready for cyanide leaching and carbon adsorption for gold extraction. A high grade gold solution is then produced for electrowinning which is followed by smelting to create doré bars. A doré bar is a semi-pure alloy of gold and silver. The dense particles from the cyclone underflow are sent back to the grinding mill, but before they get there, these particles pass through a Falcon Concentrator. This machine can collect gold from the cyclone underflow, which is then sent to a shaking table or Sepro leach reactor for further upgrading. All other particles not collected by the Falcon are sent back to the mill for further grinding. After the collected gold from the Falcon Concentrator is upgraded by the shaking table or Sepro leach reactor, it joins the gold from the conventional leaching circuit in either the electrowinning or smelting stage of the circuit. A typical flowsheet for free-milling gold is shown below. It is possible for gold to occur in close association with sulfide minerals such as arsenopyrite, pyrite, and chalcopyrite. Sulfide-associated gold is often very fine in nature and difficult to separate from the sulfides. So how is this done in an economical and effective way? In many cases, portions of sulfide-associated gold can be considered free-milling and can be recovered using the gravity recovery process described above. For the portion of sulfide-associated gold that is not free-milling, different tactics are needed to extract the gold. Typically, this type of gold is recovered with froth flotation. The gravity-flotation combination to recover sulfide-associated gold begins the same way as the free-milling process, with crushing and grinding. The exception here is that instead of sending the cyclone overflow for cyanide leaching, it is sent instead for flotation processing. The particles are mixed with chemical reagents to render the surfaces of the gold-containing sulfide mineral hydrophobic. Froth flotation cells bubble air through the slurry. These air bubbles attach to the now hydrophobic gold and float them to the surface. The concentrated minerals float above the solution and can be collected and sent for smelting. 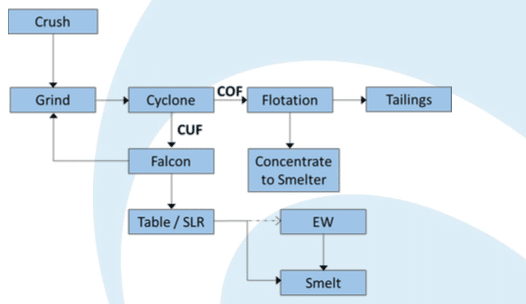 The cyclone underflow is still sent to a Falcon Concentrator for fine gold recovery, and the gold is still sent to a shaking table or Sepro leach reactor for further upgrading. The other particles go back to the start of the circuit for further grinding as well. The last type of gold deposit is called refractory gold, and it is the most difficult type to extract. It can be defined as any ore that responds poorly to a conventional gravity-cyanidation process with examples including copper porphyry, complex sulfides, arsenopyrite and lead-zinc associations. Ultra-fine gold particles can be trapped within the mineral matrix, even at extremely fine grind sizes. Three primary factors cause gold to be considered refractory. Each factor needs to be addressed with a different type of pre-treatment before gold can be recovered by conventional cyanidation. These factors are physical encapsulation, chemical interference, and preg-robbing elements. Extremely fine (<10μm) particles are locked within an impervious, unreactive mineral. This can be overcome by ultra-fine grinding. However, this is often not economically viable. If the gold is encapsulated in sulfides, oxidation of the sulfide minerals by roasting, pressure oxidation, or bio-oxidation is used. This occurs when there are minerals in the ore that consume large quantities of cyanide or oxygen. These minerals interfere with the leaching process and need to be removed or altered before conventional gold recovery can take place. After identifying the obstructing mineral, it can be dealt with accordingly. Carbon is a preg-robbing mineral and can be managed in a few different ways. It can be burned off, treated with pre-flotation, or deactivated with other chemicals. In recent years gravity concentration has been used as an effective treatment for dealing with carbonaceous ores. For optimal gold recovery, it is vital to know the type of ore you’re dealing with. With decades of experience recovering gold, Sepro can recommend the best equipment and systems to maximize your next mineral processing project. To get started, contact your gold recovery experts today. Find out more about gold recovery in our most recent white paper.